Shake n Bake is a 3-reel 10-payline video slot released by NYX and focused on high-limit players who prefer to bet big, as stakes on this slot are adjusted from $0.1 to $500 per spin. The slot has a mouth-watering sweets theme, and its symbols include chocolate bars, cakes, ice cream cones, hard candies and other confectionary products. Low-paying symbols award $0.2 to $250 for hitting a three-symbol match. Mid-paying symbols produce a win of up to $5000 if two or three identical symbols land on a payline. The slot features a scatter that brings a 2-coin win whenever three of them land in any place. 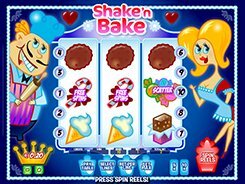 Besides, Shake n Bake offers two or four retriggerable free spins activated by 2 or 3 Candy Cane symbols. On top of that, the slot features a bonus game that is played on the second screen and may award a maximum of 100 coins ($5000 on the maximum stake). Boasting high bet limits and impressive payouts, the game may appeal to a variety of slot players, especially to high rollers. PLAY FOR REAL MONEY!